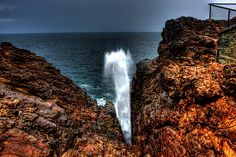 The Hummanaya-Blow Hole The Hummanaya-Blow Hole is a natural fountain, caused when sea water rushes through a submerged cavern and is pushed upwards. Hummanaya is located on the southern Sri Lankan coast. The ocean water flows underneath the shore, and then comes out of this hole due to pressure. Water shoots up every minute or so, and it gives very serene feeling. The spray is often as high as 25 meters, giving on lookers a sea bath on land.